Tom Wolf: Cut personal taxes 13%; fund schools by gas extraction tax. Martin O`Malley: Tax reductions & regulatory reforms to help job creators. Pat McCrory: Tax & unemployment overhaul helped economic crisis recovery. David Ige: We are spending more than we take in; fix the imbalance. Bill Walker: Low oil prices mean millions in state budget deficit. Andrew Cuomo: 2015 Opportunity Agenda: cut $1.7B taxes; add $1.5B programs. Mike Pence: Amend state constitution to require a balanced budget. John Kitzhaber: State recovering from Great Recession, but not every person. David Ige: Follow the lessons offered by our host culture. Andrew Cuomo: Pay equity for women; stop pregnancy discrimination. Tom Wolf: Lower corporate tax rate by 50%, and close loopholes. Bill Haslam: Revenue Modernization Act: level playing field for business. Martin O`Malley: Change Maryland's anti-business attitude. Martin O`Malley: Repeal personal property tax on small business. Pat McCrory: NC Competes: promote long-term job growth in global market. David Ige: $10 million for HI Growth initiative to support innovation. Chris Christie: $2.3 billion small business tax relief package. Pat McCrory: Celebrate police who come back stronger after getting shot. Andrew Cuomo: Raise the Age: prosecute 16- and 17-year olds as juveniles. Andrew Cuomo: Recruit more minorities into law enforcement. Martin O`Malley: Executive Order to address this heroin epidemic. Pat McCrory: Let's Talk It Out: campaign to stop underage drinking. Chris Christie: Drug addiction is a disease & it can be treated. Tom Wolf: $15M for community colleges but they must freeze tuition. Bill Haslam: Tennessee Promise: two years of free community college. Bill Haslam: $2.5M for SAILS program: math tutors for high school seniors. Martin O`Malley: Encourage more public charter schools. Martin O`Malley: Tax credits for contributions to private & parochial schools. Andrew Cuomo: Invest in the teaching profession, plus teacher evaluations. Andrew Cuomo: Ambitious P-12 agenda to stop NY from falling behind. Andrew Cuomo: MA model for NY: receivership when schools fail for 3 years. Andrew Cuomo: Expand charter schools: more lotteries; 100 more slots. Andrew Cuomo: Full SUNY or CUNY tuition for schoolteachers. Chris Christie: Tenure reform for failing teachers; merit pay for good ones. Chris Christie: Choice of schools to meet child's needs. Martin O`Malley: End the automatic gas tax increase. Mike Pence: All-of-the-above energy strategy instead of EPA over-reach. Bill Haslam: 35 million visits annually to Tennessee State Parks. Steve Bullock: MT economy depends on hunting & fishing; let's fund LWCF. Andrew Cuomo: $172M for Environmental Protection Fund. Bill Haslam: Response speed exceeds standard for Child Abuse Hotline. David Ige: Government builds a home for our kupuna and our children. Bill Walker: First Lady will chair Alaska Children's Trust. Phil Bryant: Support Equal Opportunity for Students with Special Needs. Andrew Cuomo: Trade mission to Cuba across a multitude of sectors. Mike Pence: We're in a global war of civilization against barbarism. Tom Wolf: Create "Made in Pennsylvania" cash-back jobs program. Andrew Cuomo: $35M for New York export-import program. Martin O`Malley: Fair Campaign Financing Act for gubernatorial elections. Andrew Cuomo: Campaign contributions only for election-related expenses. Bill Haslam: Must provide health coverage, if not Insure Tennessee. Pat McCrory: Healthy NC reform: controls costs & incentivizes providers. Pat McCrory: Reform Medicaid based on NC plan, not DC plan. Steve Bullock: Insure the working poor with federal dollars. Chris Christie: Hold down Medicaid costs while providing focused choice. Pat McCrory: Establish state Department of Military and Veterans Affairs. David Ige: Proactive and aggressive support of troops in Hawaii. Bill Walker: Thank our military and law enforcement for their sacrifice. Andrew Cuomo: $80M investment in emergency response. David Ige: Make Hawaii farms more sustainable; above 15% level now. Peter Ricketts: Grow Nebraska: create jobs by recruiting new businesses. Phil Bryant: $50M for Keep Mississippi Working Fund & workforce training. Chris Christie: Focus on reducing unemployment but not government employment. David Ige: Good hospitals must be distributed throughout the islands. Bill Walker: Tourism produces 50,000 jobs and $4B annually. Andrew Cuomo: $1.5 billion Upstate NY Economic Revitalization Competition. Tom Wolf: Schools that teach; jobs that pay; government that works. Bill Walker: Don't panic when times are tough; make a plan. John Kitzhaber: 36 years in government: state House; state Senate; Governor. Tom Wolf: Stop paying Wall Street millions to manage PA pension fund. Martin O`Malley: Repeal income tax on retired veterans; & later all retirees. Chris Christie: State pensions cut by $120B; but $90B still to go. Tom Wolf: Cut property tax; raise sales tax & income tax. Chris Christie: I will veto any income tax increases that come before me. Mike Pence: Simplify the tax code. Martin O`Malley: $25M more for road improvements. Pat McCrory: Establish cabinet-level Department of Information Technology. Steve Bullock: Create jobs by investing in roads and bridges. Andrew Cuomo: $291M for road & airport infrastructure improvements. Bill Walker: Unacceptable that so many Alaskans wake up in a cold house. Peter Ricketts: People-centric services: hand up to get back on their feet. Andrew Cuomo: Establish office of Faith-Based community development. 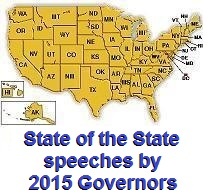 The above quotations are from 2015 Governor's State of the State speeches.